It was always the same the first Saturday night of the month. Beardless boys in the lamplight outside the Coney trying to coax a free show from whores on its balcony. Fiddle music and laughter pitching from the open doors of the Silver Pearl. Some fool splattering his guts in the dry ditch by the boardwalk. Wharton curled his lip as he watched the boy on his knees. Shouldn’t be allowed to waste liquor that way. Shouldn’t be allowed into town. Tightening his grip on his bottle, he clutched the wooden upright and stumbled off the covered boardwalk. Better to swing wide. Wouldn’t be the first time his bottle had been snatched and he’d had to dance a jig for it. But he’d hardly taken a step when a hidden cur began a throaty growl. “Quiet, yer mangy—” Faint hollering twitched at his ears as he felt a vibration through his boot soles. Stepping back, he reached for the empty rail as a bunch of cowhands raced along the street flagging their hats and kicking up dust, guttering the torchlights in their breeze. He let fly with a string of profanities before catching himself, his gaze darting to the youngsters in front of the Coney. They hadn’t heard him in the commotion. Wiping the spittle from his lips he began to zigzag across the rutted street, the bottle nestled close. At least the riders weren’t shooting, not like in the old days before the ordinance. The torch nearest the corner flared as Wharton turned into the alley, his shadow stretching ahead of him before melding with the darkness caught between the buildings. Pausing to belch, he reached out a hand to steady himself against the rotting clap-board. Part of his winnings had gone on the extra bottle, and part on feeling up that new whore of Molly’s. Little cat had tried to take him to one of the back rooms, but he wasn’t so drunk that he was a fool. He’d leave her ’til he was sober. A man needed to get his money’s worth, and that new one looked worth his money. Sure of his gait now, he headed for the deeper patch of black that crowded the door to the flop-house. He’d nearly made it to the step when someone called his name. A shape as dark as the Devil eased out from the wall to stand silhouetted in the torchlight. There was a sharp scraping and a Lucifer flared. Wharton saw the face beneath the broad brim and dragged in such a breath that he nearly choked on it. The hand lowered, pooling the match’s flickering light along the waiting gun barrel. Wharton stumbled back, his bowels as unsteady as his legs. The Lucifer faded and the gun roared. Vern was grizzling again, wanting to hold on to his Pa’s leg. Jed Longman eyed first the stream of saliva cleaning a course down his youngest son’s chin, and then his eldest standing in front of their canvas tent. Jed removed his hat and pushed his fingers through his unkempt hair. If it weren’t one thing it were another. All around him among the tents, families were greasing wheels and re-packing wagons the way they’d done each and every day since signing on and being allotted a place. Nerves, Jed had told Tom, folks doing nothing, just filling time. His eldest had nodded sagely, showing more understanding than his nine years gave him credit for. Jed was aware of him now, holding the hands of his younger brothers, waiting on his reply. And here he was, doing nothing, just filling time. “Agree!” Jed slapped his hat across his thigh and, casting a glance over his three boys, ushered the man away a step. He kept his voice low but gave it the venom the request deserved. “Goddamn it, Longman, you’re not listening with both ears. You mention that sort of talk in Mrs Harris’ hearing and I’d wager you’d be on your way to the druggist.” Colonel Fremont pinked a little behind his whitening whiskers and let some of his bluster dissipate. “Then she ain’t no lady,” Jed spat. 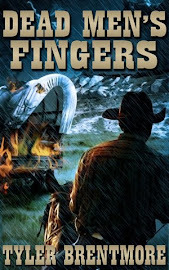 From the way Fremont had described her, Jed had expected a fleshy, middle-aged frump with a ramrod back scowling through a pair of pince-nez spectacles, but the woman who had sneaked up behind the tent was willowy and younger than himself. He’d been right about the back, though. She held herself tall in her high-collared store-bought dress, and despite its ribbon fastening, the hat was prim enough for any woman used to standing before a chalk-board. Fremont hadn’t exaggerated a jot about her fierce gaze, neither. “Mrs Harris...” spluttered the wagonmaster. There was no bob of her head in acknowledgement. Instead Mrs Harris stepped forward to offer a lace-gloved hand. Jed supposed it only right to accept it under the circumstances, but became acutely aware of the dirt ingraining his knuckles. It had been a while since the soap had seen the scrubbing brush. Martha would have sure given him an earful. He eyed her a moment and it was she who averted her gaze, but within a breath she was back at him, just as Fremont had cautioned. “Mrs Harris won’t be a bother, Pa,” Tom offered. Without turning, he waved his son quiet. Nor her man, Jed mused. Mrs Harris was a thin ’un, true, and although he was trying hard to keep his eyes on her face, she had all the right curves in all the right places and a smell about her that he hadn’t had in his nostrils for many a day. No, his instinct had been correct from the start. Mrs Harris, school ma’am or not, was a barrel o’trouble he could do without. With no one holding his hand, Vern’s grizzling raised a pitch and then he began to sob. Jed glanced at him and realized that his youngest stood alone. His six year old brother was no longer standing in front of their tent. Jake had eased round to Mrs Harris and was holding her gloved hand and whispering, all wheedling smiles. “Well, Jacob, I might have a piece in my purse if I look hard enough,” the woman was saying to him, and out of the lace wrist-bag came a bundle of twisted barley-sugar. Jed felt his jaw sag, then he gritted his teeth. “What is this?” He turned back to his eldest for explanation, but Tom’s defiance had fled and he was being eyed through lowered lashes. Mrs Harris was already round his arm hunkering down beside his crying youngest, who threw his chubby arms around her neck. Disentangling herself from Vernon’s arms she drew a kerchief from her purse and wiped his eyes, cooing to him low and steadily. It didn’t seem to have any effect. Mrs Harris looked mortified. “I did no such thing, young Thomas! At least... not in so many words.” She adjusted her bearing and turned back to Vernon, removing her glove to smooth her hand over his face. Jed looked into her widened eyes and then beyond her shoulder to where Tom was trying to pull his youngest to his feet. There was a sudden empty feeling in Jed’s gut. He glanced at Tom, remembering the boy telling him that Vern had pushed aside his morning vittles. “All right, all right!” He was well ahead of her and didn’t want to hear it coming from her mouth. Or have her frightening his boys. One sick child could as easily turn into three and there would be no way he could do all the chores, act the nurse-maid and goad the oxen. Not on his own. This sudden intervention of a shadowy Mr Harris caught Jed by surprise. He’d taken it for granted that she was a widow-woman. He let her take Vern into the tent away from prying eyes and quietly brought the medicine box from the wagon. Jake was more than happy to stay close to Mrs Harris to do her bidding and, picking up pails and fodder, Jed and Tom made their way beyond the encampment to where the animals were being kept. The boy nodded, though his face had become pinched beneath its grime. Jed squinted at him some more. Being the eldest Tom was the only one who remembered all the deaths: Jo-Ann and Charlotte. Then baby Liza. Finally Martha. No, not Martha. They’d been gone two days, he and Tom, checking on the trap-line, and for some reason, for some Heaven-sent reason he’d left Tom to water the horses and had entered the cabin alone. He shuddered as the images burgeoned in his mind. Death wasn’t going to enter his life again and take his boys. He wasn’t going to let it. In their absence Mrs Harris had been taking care of more than Jed anticipated. Where did you leave... your Winchester?